Published in The Province (July 25, 2017). The B.C. Energy Step Code, a provincial standard enacted in April 2017, provides a pathway to more energy-efficient buildings. B.C. municipalities have a brand new tool in their energy efficiency toolbox. The B.C. Energy Step Code is a set of incremental opt-in standards for new homes and buildings that aims to make them healthier, more comfortable, and more affordable to heat. Over the next three to five years, it’s important that local governments begin choosing and adopting a tier of the Step Code. This will demonstrate the value to consumers of more efficient buildings — including lower heating bills, better air quality, and reduced pollution — and encourage others to lead. Any municipalities that currently require improved energy efficiency through their own bylaws will also need to adopt an equivalent level of the Step Code by the end of this year. The Step Code will give consumers a consistent and easy-to-understand rating system, and has been developed in collaboration with a wide range of stakeholders, including the building and development industry. In creating the Step Code, B.C. has learned from the experiences of several U.S. states and Ontario, all of which have adopted similar requirements. As part of the province’s plans under the Climate Leadership Plan and the Building Act, cities and towns in B.C. 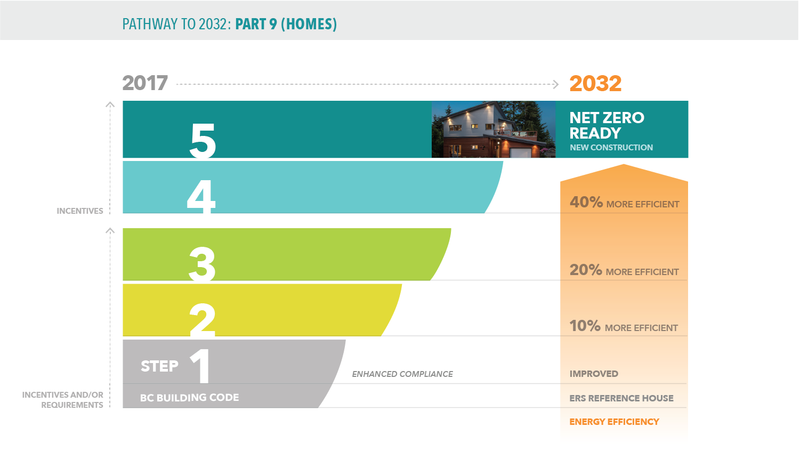 are now able to require or incentivize one of five levels of improved building performance — from the first step of improved code compliance all the way toward net-zero energy ready, the final step. Net-zero energy ready buildings are ultra efficient; they can theoretically produce all of the energy they require over a year using solar panels. The government plans to revise the B.C. 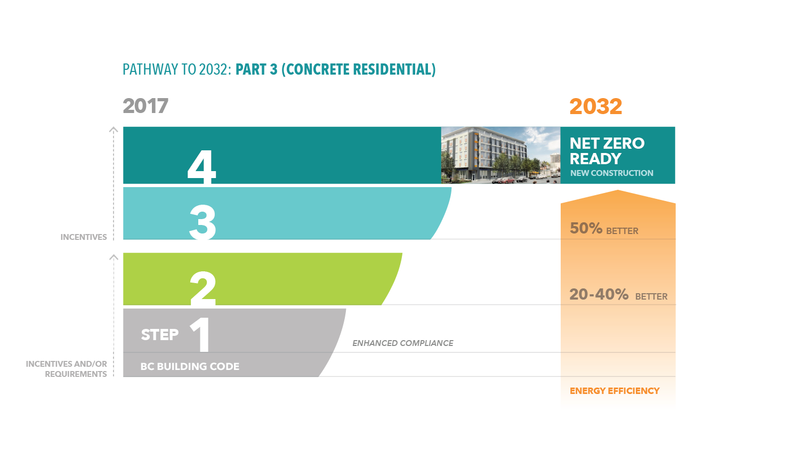 Building Code to require all new buildings meet net-zero energy ready standards by 2032 at the latest. In the meantime, municipalities can get a leg up and start building the industry capacity and experience required to smoothly transition to more efficient building practices. Adopting the Step Code sends an important message that local governments are ready to step up in modernizing the way we design and construct buildings. All around the province, energy efficient buildings are being built and recognized for the health and comfort benefits that they bring, including better air quality, reduced mould and moisture, and lower energy costs. For the lower tiers (Steps 1 to 3) of the Step Code, many builders are now able to construct to these standards at little to no additional cost, without impacting the market price paid by consumers. A study completed this summer shows that constructing homes and apartment buildings to Step 3 in most parts of the province would result in 20% energy savings and less than 1.5% incremental construction costs — an amount easily offset by energy bill savings. In fact, some regions of the province, such as the Okanagan and Southern Interior, could even see savings on construction alone if they adopted Step 2 or 3 as their base requirement. For more ambitious builders, the costs of very high-performance buildings are falling rapidly. The highest tiers (Steps 4 and 5) of the Step Code typically cost no more than 5% extra for construction, and reduced heating bills offset these costs. Municipalities offering incentives for these higher tiers can drive innovation at the highest levels of performance, helping to bring the costs down over time. These high-performance buildings (including projects built to the Passive House standard) are already popping up all around the province, from Vancouver to Fort St. John. Leading municipalities — Saanich, New Westminster, Richmond, and others — are already planning their transition with the support of the Energy Step Code Council, a group established to assist municipalities in adopting the requirements. The B.C. Energy Step Code represents a modern, affordable, and technically achievable approach to new construction — and a blueprint for other jurisdictions. It will predictably and consistently improve health and comfort, and reduce carbon emissions from our homes and buildings. Local governments will find the Step Code a powerful tool for delivering quality and affordability, meeting climate targets, and giving homebuilders and developers a predictable pathway towards better performance. As we start transitioning to net-zero ready building codes in this province and across Canada, municipalities in B.C. have an important opportunity to choose the pace and scale of ambition that makes sense for them, rather than playing catch-up when regulations change. Jonathan Coté is the mayor of the City of New Westminster. Judy Brownoff is a councillor with the District of Saanich. Karen Tam Wu is the acting B.C. director at the Pembina Institute. This op-ed originally appeared on page A11 of the Province on July 25, 2017. Tags: British Columbia, Provincial Policy, Community Policy, Energy Efficiency, Urban Planning, Buildings. Karen Tam Wu is the managing director of B.C. at the Pembina Institute, and is based in Vancouver.